Large full color charts for reindeer and bird pattern at cuffs. Also available as part of Winter Wonderland Knits. 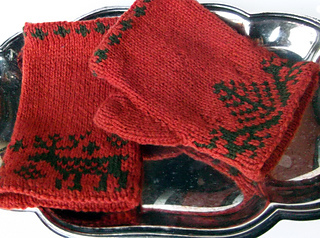 Reindeer prance and birds flock across the winter landscape in these short wrist warmers. 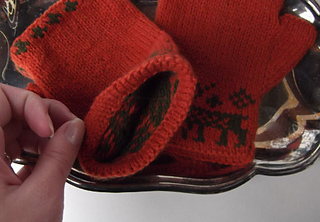 One wrist warmer has two reindeer- one on each side of the wrist-playing in amongst the snowflakes. The other wrist warmer has birds flocking to a tree on each side. 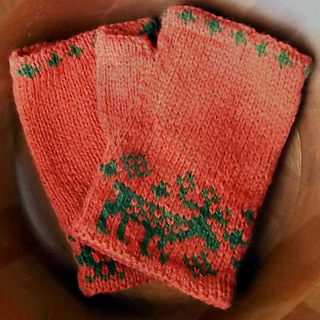 The wrist warmers fit both right and left hands, so if you wish you may knit up two if the same side if you want just the reindeer or birds- but I think one of each adds a touch of whimsy! With the Fair Isle inspired patterning only on the cuffs, knitting is quick. The thumb gusset and simple hems add professional looking finishing touches. Women’s size medium. Finished size 7 inches around and 5 ¾ inches long after blocking. Thumb opening up to 2 ¼ inches around. Length: You can make the bottom cuff longer by knitting around in the main color until cuff is as long as desired, then proceed to knit the thumb gusset as directed. Charts: Charts are knit right to left every row. The Landscape Colorwork Chart- Birds is symmetrical (both sides of the wrist are the same), while Landscape Colorwork Chart- Reindeer is not. Carrying the yarn: In colorwork it is best to not carry yarn behind another color when working for more than 5-6 stitches, or the yarn in back has a tendency to be too loose or too tight, making your wrist warmers bunch up. Make sure to twist the yarns around each other behind your work for long sections of one color in the pattern.